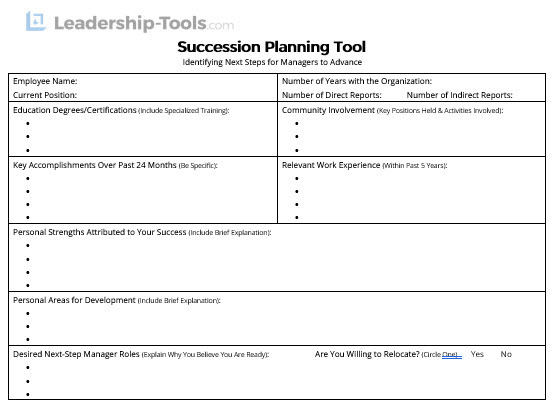 Succession planning tools allow you to identify future leaders of the organization, which helps to ensure continued business growth and stabilization of your workforce. People want to know, to the extent possible, what the future holds. Business owners can put the minds of their most valuable employees at ease by making certain that leadership ranks are well defined in the event of a disaster or unexpected event. Planning for future leadership is a critical activity for all successful organizations. It's important for a business owner to know that there are highly qualified people in all key positions - not just today, but tomorrow, next year, and well into the future. Succession planning activities should be conducted annually to ensure that there is solid bench-strength for every key position of the business. Current leadership will conduct an evaluation of future leaders, including a complete assessment of competencies and skills required for each leadership role. Succession reviews are a proven process that identifies talented employees; works to develop their skills and abilities over time, and prepares them to fill critical roles in the future. ""Believe in your people to do more; encourage them to learn and grow; help them to achieve new levels of competency, and you will secure the future of the business." 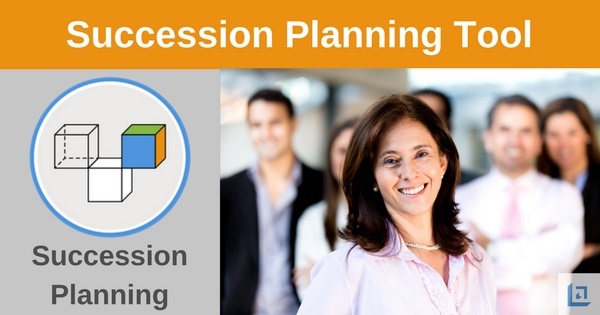 Increased retention is a natural benefit of succession planning. Companies that invest in leadership development and the succession planning process are more successful in retaining top talent, since they know you have identified them for future leadership positions. The process provides yet another great opportunity to recognize your best people, which in turns strengthens their commitment and loyalty to the organization. Employees that know you are committed to invest in their future, will respond by working harder, producing more and improving profitability. The organization's investment in leadership development and skill training activities can make a lot of sense financially. The investment is quite minimal when you compare the total cost of recruiting and training top talent. "Average people do not want others to go beyond average." Identifying key players in your organization early allows you the luxury of developing their knowledge and skill-set now so they will be well prepared to take the reins when the time comes to do so. Succession planning puts all stakeholders at ease knowing that their interests are secure now and well into the future. Succession planning typically target key leadership positions. However, you can include multiple levels of management and include top positions in a variety of job categories. With a formalized cross-training system in place, employees throughout the entire organization can be better prepared to fill key roles as the need arises. Whether a key contributor leaves as planned, or unexpectedly, effective succession planning allows the business to remain strong and healthy since the next crop of top candidates are fully prepared to step into the role and hit the ground running. Employees better understand the organization's long-term goals and objectives. Business owners use effective planning tools to clearly identify the developmental needs of their future leaders. Employees better understand what the company is looking for, what skills and talents are highly valued and what they need to work on to become better positions for future roles. A business that creates a solid bench strength of talented team members are much less likely to fall on hard times, and have a higher probability to experience continued and uninterrupted growth. Succession planning tools can make all the difference in determining a company that is at a high or low risk of failure. Companies that depend on one person or a handful of people risk everything when one or more of the key leaders exit the company. Education Degrees and/or Certifications - understand each candidates educational background, including any vocational training or special certifications they may hold. Relevant Work Experience - skills developed from on the job training can be even more important than formal education as these include skills such as negotiation, conflict resolution, strategic planning and others, that are not always required courses in order to obtain certain degrees. Work related experience also tends to be within the same industry, although skills developed can overlap multiple industries. Community Involvement - leaders who are committed to their team members and the company they work for are often highly committed to their community as well. These are people who are servant leaders. They understand the bigger picture when making decisions. They tend to focus not so much on how a decision impact themselves, but how the decision contributes to the well being of all key stakeholders. Key Accomplishments - leaders who are deserving of promotional opportunities should have a strong track record of success. More importantly, there should be a clear pattern of accomplishments throughout their career, and specifically within the last 2 years. Results are always more important than activities when considering people for advancement. Personal Strengths - candidates ready for future leadership positions will know their strengths, and they also are known for their strengths. Gaining feedback from their team members and/or co-workers can be a critical component to succession planning. Our 360 Degree Feedback Assessment can provide excellent input to go along with the succession planning too. Areas for Development - in addition to knowing one's strengths, you must also have a clear understanding of the areas that need further development. StrengthFinders is a highly effective and inexpensive tool that can assist in identifying each candidates strengths and weaknesses. Consider requiring every person that is being considered for succession to complete the StrengthsFinder assessment. Not only will you learn a lot about the candidate, they will learn a great deal about themselves. Readiness Explanation - leaders who seek advancement must also have a clear understanding about why they believe they are ready for a future leadership position. If they lack self awareness in this area and cannot clearly articulate their readiness for the position, they they are not a strong candidate at this time. Ask each candidate to explain in their own words why they should be chosen over other candidates. Their response should be substantive and supported by a clear pattern of accomplishments. Open for Relocation? - some positions might require a candidate to relocate geographically, perhaps to where the company headquarters is located. It's important to understand each candidates ability and willingness to move in order to accept opportunities for promotion. Their decision can be highly influenced by family members and ties to their current community. Although our succession planning tool does not assign a weighting to each of the above categories, you may decide to do this if you believe there are some categories that are more important than others. Additional categories can also be added as you see fit depending on the type of leadership positions you are seeking to fill. To download our free Succession Planning tool simply subscribe to our free newsletter. You will immediately receive a password that grants access to our entire leadership tools library.